Team days with Clay Pigeon Shooting. This is one of the most popular country pursuit activities, made even more popular by the success of Great Britain in the 2012 Olympics. ACF Team Building and Events caters for complete beginners to the more experienced shot and uses lighter-weight clay pigeon shooting equipment for ladies. Each shooting stand will be manned by a qualified instructor who will show guests various techniques of clay pigeon shooting e.g. crossing pigeon, high pheasant. 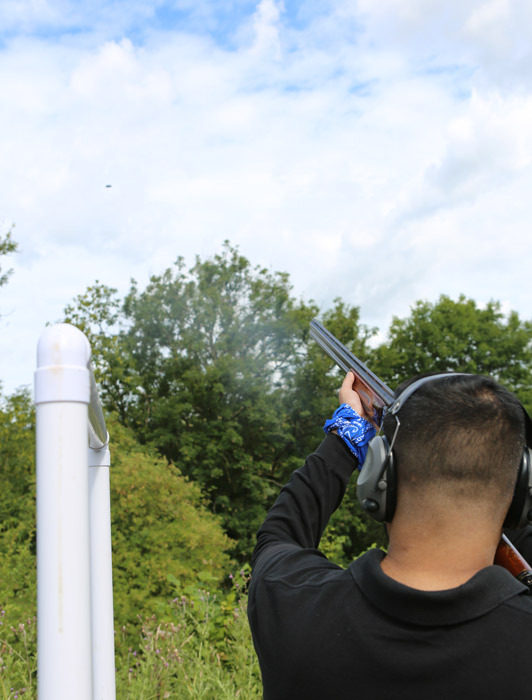 Shooting approximately 25 clays during an hour's session, guests will have the opportunity to practise before their scores count towards the winning trophy. Whether you are looking for one to one tuition or include this within a corporate event, or an away day, we have the equipment and instructors to suit. We have the equipment and expertise to hold Clay Pigeon Shooting events all over the country. Or, we have the perfect grounds to hold Clay Pigeon Shooting days at our beautiful activity site in South Bristol. You can also buy a gift voucher for Clay Pigeon Shooting here.